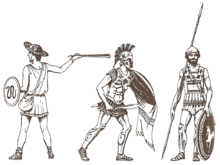 Greek soldiers of Greco-Persian Wars. Left: Greek slinger. Right - hoplites. Middle hoplite's shield has a curtain which serves as a protection from arrows. ප්‍රහාරයන්ගෙන් සිරුර ආරක්‍ෂාකරගැනීම සඳහා යොදාගන්නා උපකරණයකි. මේ පිටුව අන්තිමට සැකසුවේ 14 අගෝස්තු 2014 දින දී, 05:34 වේලාවෙහිදීය.